In most industrial applications, compressed-air flow changes constantly as loads turn on and off and as compressors load and unload. Usage is more accurately judged from a steady average than from a fluctuating rate display. 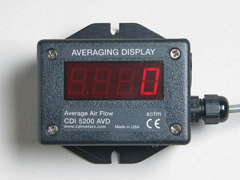 The CDI 6000 AVD display shows a rolling average of air flow taken over a period of time, from one minute to four hours, selected by the user. The period over which the average is calculated is divided into ten equal segments, the oldest of these being discarded each time a new one is completed. Consequently, the period between changes in the display is one tenth of the overall averaging period. A pushbutton programs the display, and permits the user to temporarily see the current rate value.